The Business Card Menger Sponge is a project conceived and executed by MIT trained engineer Dr. Jeannine Mosely in which she made a giant model of a fractal out of 66,000 business cards, a meshing of mathematics and origami that has since inspired thousands of folders around the world. Dr. Mosely's sponge endeavor spanned nine years and engaged hundreds of people across the USA. In 2006. Margaret Wertheim curated an exhibition of the Business Card Menger Sponge at Machine Project gallery in Los Angeles. In 2011/2012 Wertheim and Mosely jointly spear-headed an endeavor at the University of Southern California Libraries in which they and hundreds of USC students and staff collectively built a different fractal, called the Mosely Snowflake Sponge. More Information coming soon. 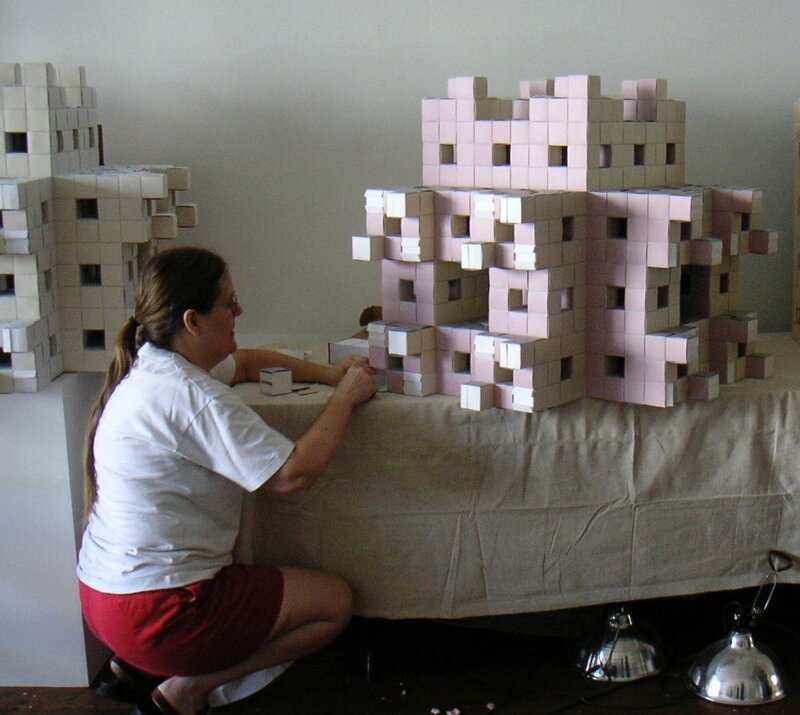 Images below of Dr. Mosely assembling the Business Card Menger Sponge at Machine Project gallery.